I am a leather jacket-aholic. In my world, you can never have too many leather jackets and that’s why my parents got me this gorgeous brown leather Roots Shane Jacket ($560 - exact jacket no longer available). As far as leather jackets go, Roots has great value for quality. If you’re not familiar with the Roots, it’s a fabulous Canadian brand that makes amazing leather goods (bags, jackets, shoes), clothes and accessories. I’ve loved the brand since I was a kid and they just have the most amazing quality leather that just looks better with age. 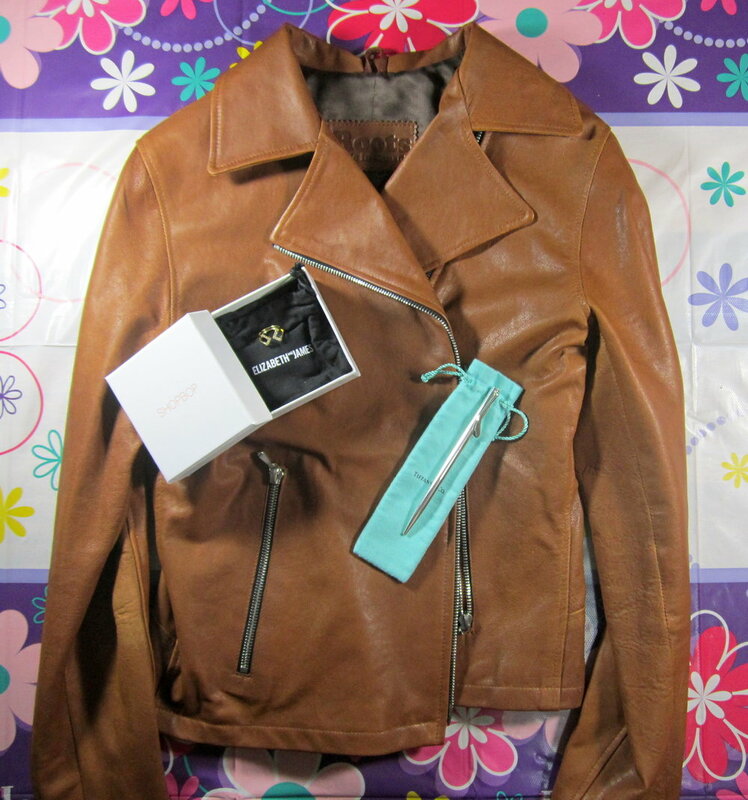 This brown leather jacket is just so rich which a great collar and an off-center zipper. It is definitely my new favourite piece in my leather collection. Look out for a brand focused Roots post coming soon! I absolutely love my new 24k gold plated Elizabeth and James Kurli Ring ($125 from Shopbop). 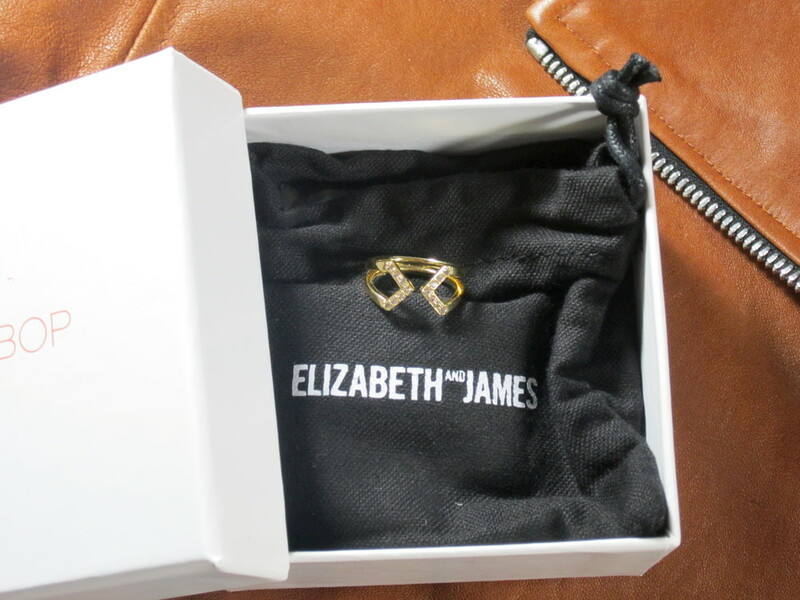 I love everything Elizabeth and James, it’s definitely one of my favourite brands for both clothing and accessories. I really wanted to change up my jewelry; 99 per cent of the time I’m wearing the same necklace and rings. This new ring is super cute and quite dainty, but it also has a bit of an edge with its shape. I also love that it comes in small sizes, I’m not the skinniest person in the world but I do have skinny fingers (I know it doesn't look like it in the picture, but trust me) and I love that Elizabeth and James makes rings that fit me. Love, love, love! Last but not least, as a blogger, I can’t get enough of my new Tiffany & Co. sterling silver Elsa Peretti Ballpoint Pen. This is quite a nerdy gift but I love pens, my dad and I have had a joint pen collection for my entire life. The more pens the better for me and this is definitely one of the special pens in my collection. I’m sure this will help me get inspired with great ideas future blog posts. This birthday has been great, I don’t want to get too sappy but at 23 years old it feels great to be able to do what I love, on my own terms, through this lovely blog. *Disclaimer: The intent of this blog post is not to brag about what I received, it is my way of documenting my life experiences and sharing some of my favourite items.